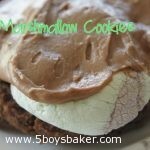 These Chocolate Marshmallow Cookies are so divine, they just melt in your mouth! I have it stashed throughout my house. Yes I am a chocolate addict, a chocoholic, a chocolate junkie, which is why I love these cookies. They are absolutely divine, they melt in your mouth, they are scrumptious, etc. I normally make these cookies with regular flavor marshmallows, but this time I made them using chocolate mint marshmallows. They were so yummy. The mint was very subtle, so if I do make them again using the mint marshmallows, I may had a drop or two of mint extract to the cookie dough. Whatever flavor of marshmallow you try, you will be in love with these cookies. If you’re not, I think there might be something seriously wrong with you. COOKIES: Preheat oven to 350 degrees. Line a cookie sheet with a piece of tin foil. Cut marshmallows in half and set aside. In mixing bowl combine shortening, sugar, milk and vanilla. Mix well and add in the dry ingredients. Using cookie scoop, drop dough onto foil-lined cookie sheet. Bake for 6 minutes. Remove from oven and place marshmallow, cut side down, on each cookie. Return to oven for 3 minutes. Remove cookies from oven and gently push down the marshmallow on each cookie. Allow cookies to cool, and frost with chocolate frosting. FROSTING:Sift powdered sugar and cocoa together. Set aside. Cream butter until smooth, add powdered sugar/cocoa alternately with milk, add vanilla. Continue beating until smooth. You can add more milk or powdered sugar to get it to the consistency you like. Thanks Melanie! Hope you enjoy it.